The answer is false. Although it is true that the right hemisphere controls the left side of the body and the left hemisphere controls the right side of the body, the overall functions may seem similar but are different. For example, the left hemisphere controls the fine motor skills while the right hemisphere controls the gross motor skills. Both hemispheres control the muscles but each targets specific characteristics. The left hemisphere sees the small picture while the right hemisphere sees the big picture. The left side handles math calculations while the right side handles math reasoning. Below is a list of some of the traits associated with each hemisphere. The two hemispheres must work together to accomplish a seemingly simple task. Being able to add and subtract (math calculations – left hemisphere) is great but being able to apply and interpret the calculations (reasoning – right hemisphere) is more meaningful. The ability for the two hemispheres to work together is crucial. So what happens when there is an imbalance and the two hemispheres do not work together in an optimal manner? This can happen when one hemisphere has developed typically while the other hemisphere is under developed. When this happens, the characteristics of the stronger developed hemisphere are exaggerated. 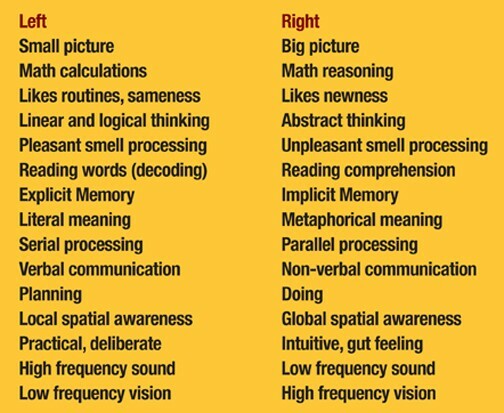 A person with a strong left hemisphere pays more attention to details, is very orderly and organized but will be more hyperactive, unable to focus, and clumsy. When there is a significant gap in development between the two hemispheres, we will see traits often associated with ADD/ADHD, dyslexia, learning disabilities, ASD, OCD and other neurological conditions. Talking in terms of hemispheric weakness, someone with a left hemisphere delay may have poor reading skills, problems with fine motor skills, poor spelling, poor object identification, poor auditory processing, poor verbal communication, delayed speech/articulation, poor memory for details/facts, task avoidance, weak immune system, misses small details, poor math operations, poor self-esteem, and poor motivation. Individuals with these traits are often diagnosed with dyslexia, processing disorders, or learning disabilities. Conversely, someone with a right hemisphere delay may exhibit hyperactivity, poor gross motor skills, lack of self-awareness, poor attention and focus, increased impulsivity or distractibility, inability to control emotions, poor non-verbal communication, inappropriate social behaviors, poor reading comprehension, OCD/stimulatory behaviors, autoimmunity, allergies, poor spatial orientation, missing the big picture, poor math reasoning, poor eye contact, and anxiety. Individuals with these traits are often diagnosed with ADD/ADHD, OCD/Anxiety, or ASD. Children with a hemispheric weakness will struggle academically and/or socially. To address the problem (not just the symptoms), the weaker hemisphere needs to become stronger which will ultimately balance the two sides and increase the communication. The Brain Balance Program™ identifies the weak side and creates a program to strengthen the weaker side thereby decreasing or eliminating the symptoms. ← Previous Story How Do The COMMON CORE STATE STANDARDS Affect Your Child? Next Story → UD Is For You!